Specific Gravity is a hallucination, an excavation, of our industrial past. 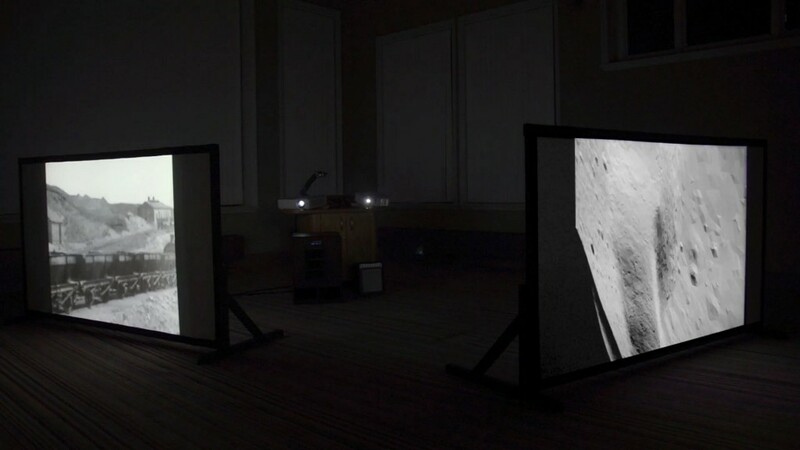 A two-screen video installation by artist Stefhan Caddick, with an original soundtrack by Harrison Banfield, Specific Gravity combines archival footage of Ebbw Vale Steelworks in south Wales from 1919, with a landscape generated from NASA’s mapping of the moon’s surface 90 years later. Originally made as an early form of advertising for Russian and French markets, the archive film’s slow, juddering panning shots depict a landscape seemingly ravaged by industry. Unfamiliar industrial structures smoke endlessly as tiny figures move jerkily around the vast site. At times the film breaks down further, kaleidoscopically refracting upon itself as fragments flicker in and out of time. The second screen depicts slow tracking shots of the lunar surface, rendering NASA’s mapping data in visible form as a faceted, fractured landscape. The ‘camera’ pans slowly across the surface, at one point picking out tracks made in 1971 by the Apollo 15 lunar rover. In the film, both landscapes seem like fictions – theatrical spaces which refer back to Georges Méliès ‘Le Voyage dans la Lune’ (1902) in which gentlemen scientists escape a polluted industrial landscape in order to explore a fictional lunar one. In much of the west, we have ‘escaped’ the landscapes depicted by Méliès and which appear in the archive, by transferring heavy industry to the other side of the world, a process that dislocates communities which once relied on those industries for employment as it degrades the environment in the east. In Sichuan province in China the smog created by heavy industry is often severe enough to partially obscure the moon and stars. In south Wales, the aftershocks of this transition are still reverberating – in the EU Referendum, Ebbw Vale voted to leave, despite benefiting massively from European structural funds, a decision which some have seen as a protest against people’s sense of being ‘left behind’ by the forces of globalisation. The film was presented as a work in progress at the 21st International Symposium on Electronic Art, in Vancouver before being premiered on the steelworks site in Ebbw Vale. The premiere took the form of an event called EBBWFERRIC comprising the film itself, a ‘hot metal’ performance, archival tours by retired steelworkers and a live sets by South Walian metal and punk bands. Specific Gravity was made with the support of the Arts Council of Wales. Archive footage used courtesy Ebbw Vale Works Archival Trust .